Combination of roasted eggplant puree, Florinis peppers and chopped fresh parsley with a strong garlic flavor and distinctive pepper flavor. The tarama salad is a creamy mixture, homogenized, with a key ingredient in tarama pulp mixed with potato flakes and rich lemon flavor. 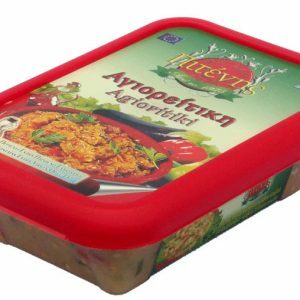 Traditional Greek recipe, world famous, prepared by 100% Okeanos preserved cod roe, potato flakes, Extra Virgin Olive Oil, rich lemon flavor, without pigments. Classic recipe with black beans, fresh and dried onion, parsley and lemon. The hummus is a traditional Ancient Greek salad, creamy, constituted of chickpeas, tahini, vegetable oil, garlic and plenty of lemon. Hummus vegetables with green onion and parsley. Hummus with olive paste “Kalamata” and basil. Hummus with fresh red pepper and red sweet pepper.